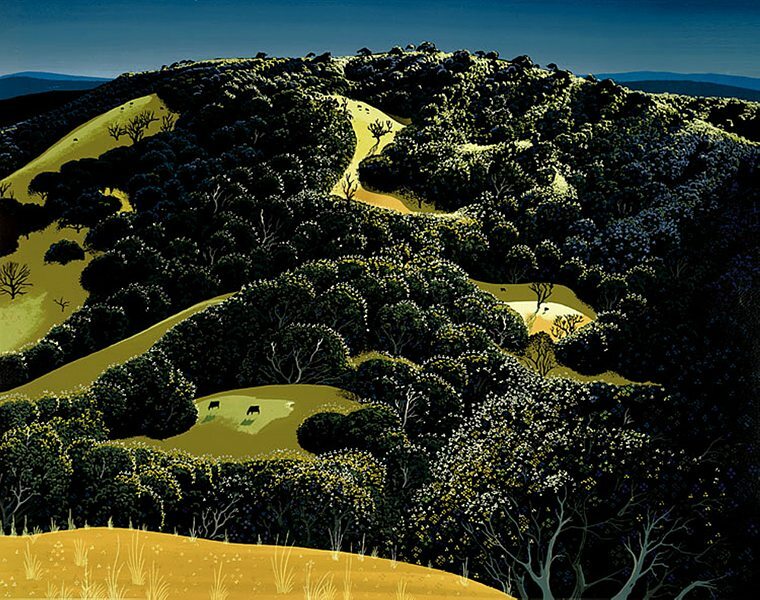 Eyvind Earle, an American illustrator and author, is a true master of contemplative landscape paintings. In nature when I look I see trees, some of them are such that they thrill me with their perfection and their sweeping lines and certain mood they seem to have. In every tree I feel as though I could see the soul of that tree, said Earle who is best known for his contribution to the background illustration and styling of Disney animations, mainly throughout the 1950s. The most prestigious institutions such as Metropolitan Museum of Art in New York, Rahr-West Art Museum, Phoenix Art Museum and Arizona State University Museum have Earle’s work in their permanent collections and he is also known for his tremendously successful solo exhibitions across the globe. 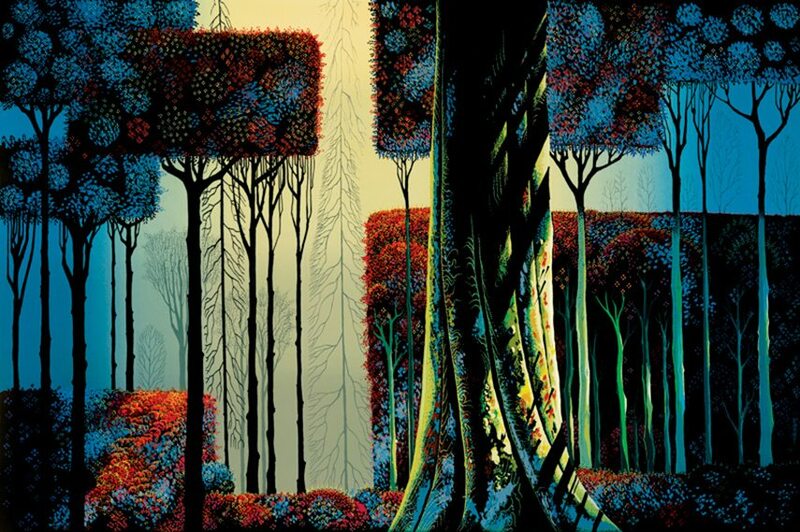 Eyvind Earle was born in New York City in 1916. Only two years later, his family decided to move to the West Coast – namely to Hollywood. 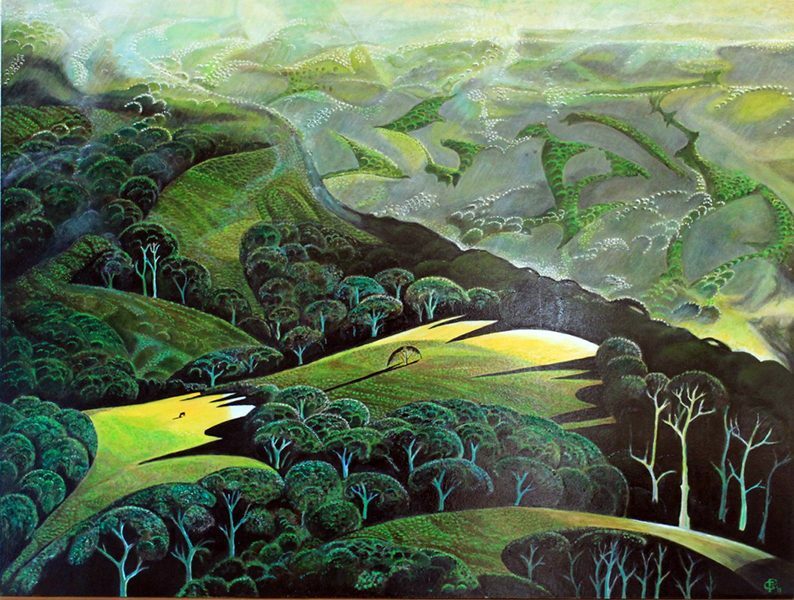 Young Eyvind started painting when he was just 10 years old. Around the same time, his father challenged him to either read books or paint every day and a brave young Eyvind exceeded his father’s expectations when he managed to do both. Earle was a talented painter from the very beginning and he had his first solo exhibition in France when he was only 14. When it comes to his first New York City exhibition, it was held at the Charles Morgan Galleries in 1937. Only two years later, in 1939, the Metropolitan Museum decided to purchase one of Earle’s works for its permanent collection, which was an unbelievable success for a young artist, having in mind the reputation of this prestigious museum. His another great achievement has happened in the 1940s when he designed roughly 800 Christmas cards for the American Artist Group. Earle’s early work was mainly straightforward realistic, but by the age of 21, the painter has become influenced by the works of many contemporary masters such as Van Gogh, Cézanne and Georgia O’Keeffe and he developed his very own style, which is closest to Magic Realism. In 1951, Earle joined Walt Disney studios, initially as an assistant of background painting. One of the first projects he received credit for was the experimental background in the Goofy short animation, called For Whom the Bulls Toll. Earle’s second project, from 1953, entitled Toot, Whistle, Plunk, and Boom was already a masterpiece which received an Academy Award as well as Cannes Film Festival Award. Needless to say, Disney was more than satisfied with Earle’s work and kept him very busy for the following ten years. Earle’s important task included painting the settings for various famous tales such as Peter Pan, Working for Peanuts, Pigs is Pigs, Paul Bunyan and Lady and the Tramp. Earle was the main artist responsible for the detailed, meticulous styling of background and its color palette. One of his universally acclaimed animated movies was Sleeping Beauty from 1959, which is also considered the very pinnacle of Earle’s career. Thanks to Earle’s wild imagination and use of magic realism techniques, Sleeping Beauty movie became known for its lush, complex medieval look. The artist has also created the dioramas for Sleeping Beauty’s Castle which can be seen at Disneyland in Anaheim, California. Another interesting fact related to this particular animated movie is that it served as the inspiration for the graphics of Sony’s first computer-generated animation from 2006, called Open Season. Earle’s work wasn’t featured only in Disney pieces, but also on television. For example, his 18-minute animation based on the story of the Nativity appeared on TV under the name The Story of Christmas, 1963. This successful piece even became digitally remastered in 1997. In addition to Earle’s career in animation, it is important to mention that the artist was an accomplished book illustrator, who designed many covers for magazine publications, as well as a commercial video artist, who produced several TV commercials. In the mid-sixties, after a few decades of successful career, Earle has decided to return to his initial passion, which was a full-time painting. He started producing various watercolors and oil works, as well as sculptures, drawings, scratchboards, and beautiful limited-edition serigraphs. Many of his works from the 60s were not showcased during his lifetime, even though he kept working diligently until the very end of his life. One thing which is surely true for Eyvind Earle is that he had a very different, totally original vision when it comes to landscape. It is hard to replicate his dream-like style, which perhaps resembles a little bit some of the backgrounds found in the imaginative pieces of Japanese director Hayao Miyazaki, who is, in a way, Japanese counterpart of Disney. Earle’s personal style merges seemingly incongruent aspects into a powerfully distinctive style which is mysterious, moody, warm and nostalgic, all at once. He skillfully captured the poignant simplicity of American countrysides and his landscapes are truly remarkable for their fairytale representation of distances, landmasses, and even weather. For 70 years, Earle said around the end of his life, I’ve painted paintings, and I’m constantly and everlastingly overwhelmed at the stupendous infinity of Nature. 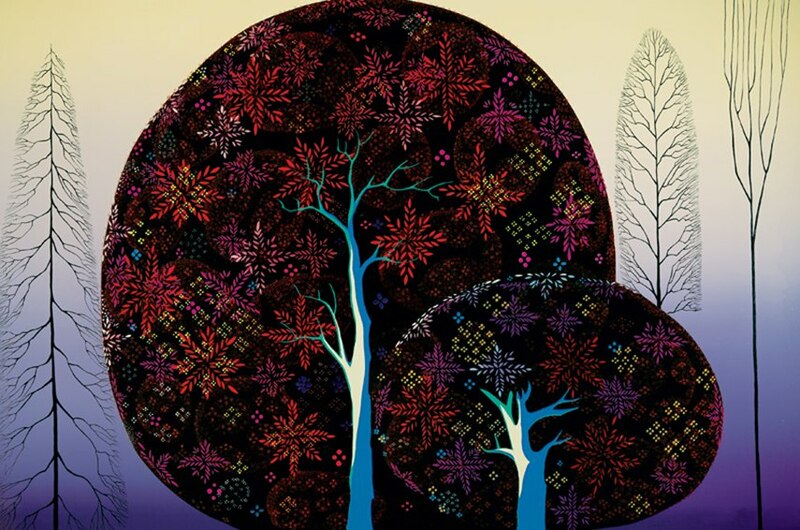 Eyvind Earle died on July 20, 2000, at the age of 84 and his entire oeuvre is now owned by Eyvind Earle Publishing LLC, under the specific instructions of the late artist. Earle’s imaginative pieces which became known across the globe thanks to Disney won many prestigious awards. In 1998, the artist won the Windson McCay Award at the 26th Annie Awards, which is a special prize given for lifetime achievements in the sector of animation. In 2015, at a D23 Expo, which is a bi-annual event in Anaheim, California that celebrates the magic, wonder, and adventure of Disney, Earle was announced a Disney Legend. His daughter, Kristin Thompson, accepted this great honor on her late father’s behalf. 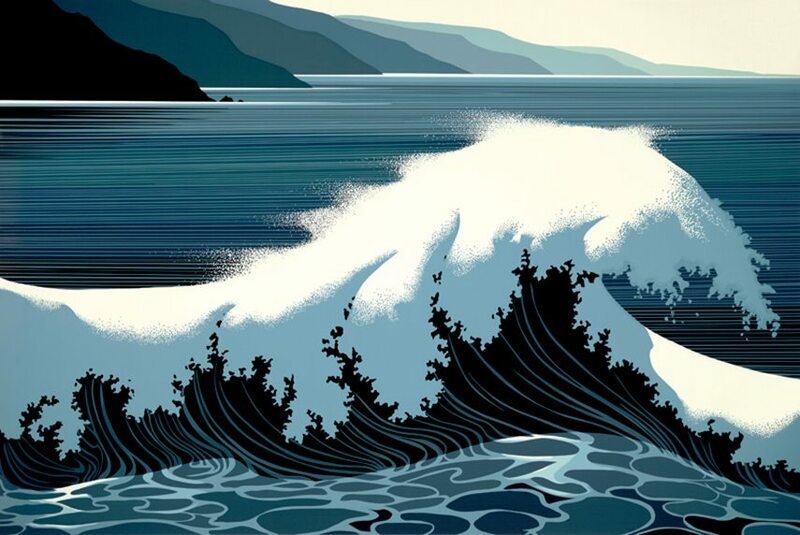 The artist’s legacy known as Eyvind Earle Publishing LLC will continue to promote and introducing his new, still unknown serigraphs and books through galleries and museums worldwide. Earle’s posthumous limited edition serigraph series will be printed based on the oil paintings currently in the collection of Joan Earle and others. Also, the artist’s Christmas cards, which include more than 800 designs have sold more than 300 million copies through American Artist Group and they are still popular and can be found and purchased through various online channels. Eyvind Early was strongly appreciated by the major publications such as Time, The Los Angeles Times, The New York Times, The New York World-Telegram, and The New York Sun, which contributed to his popularity and recognition. The term Magic Realism perfectly captures the essence Earle’s style – the colors and mood of his artworks have the amazing ability to transport the viewers to a wide-range of magical scenes. The artist’s impeccable sense of lighting and composition is beautifully blended with his nostalgic tales of fantasy and children’s fiction. Whatever beauty is, I feel it, and as long as I can I shall try to find more and more beauty, and to put it down so that others can see what I have seen, said Earle on his main motivation behind the creative processes. His poetic artworks and his specific, dream-like graphic styling continue to inspire new generations of creators, serigraph enthusiasts, and animators, who have Disney’s or perhaps Hayao Miyazaki’s style as their departure point. Even some of the newer Disney’s features, such as Pocahontas from 1995 and Frozen from 2013, are considered influenced by the original style of Earle, introduced to Disney Studios back to the golden era of the 50s. 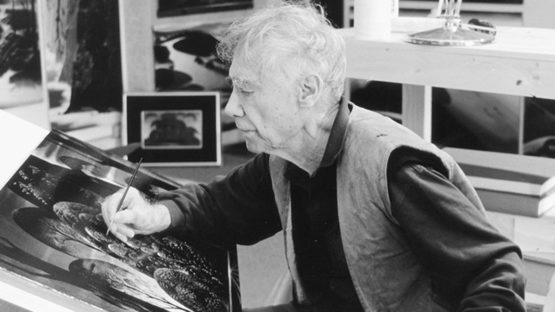 Eyvind Earle lived and worked between New York and California. All images courtesy of Eyvind Earle’s Foundation.